There are two main kinds of tofu: silken and regular. Silken tofu also called soft, silk, or Japanese-style tofu has a softer consistency than regular tofu and will fall apart if not handled carefully. You may notice that silken tofu (soft tofu), unlike regular tofu, is sometimes packaged in aseptic boxes that do not require refrigeration. Due to this, silken tofu is sometimes sold in a different section of grocery stores than regular tofu, which is packed in water and requires refrigeration. Both silken and regular tofu can be found in soft, medium, firm, and extra-firm consistencies. They are made with the same ingredients, but they are processed slightly differently and are not interchangeable in a recipe. Most recipes will let you know when silken tofu is needed. For most purposes, the different kinds of silken tofu are interchangeable, so don’t worry if your grocer only stocks one kind. Salad dressings, sauces, and desserts usually use blended or pureed silken tofu for a thick and creamy texture, serving as a stand-in for everything from soy milk to cream. Blended up, silken tofu makes a suitable substitute for dairy in many vegan dessert recipes, keeping sweets lower in fat and calories with little loss of flavor. Silken tofu in an aseptic container has a shelf life of up to a year, unopened. Once opened, submerge any used portion with water in a container, cover, and refrigerate for up to a week. Silken tofu crumbles very easily. It is not recommended that you press silken tofu; only regular or firm tofu needs to be pressed. 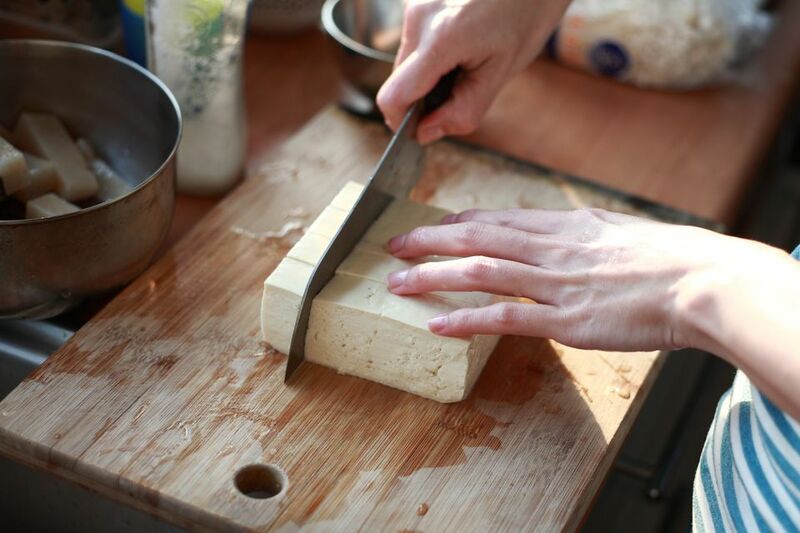 Use a very gentle hand when carefully slicing silken tofu, as it may otherwise fall apart. Regular tofu, also called Chinese-style tofu or bean curd is more common than silken tofu and comes in a plastic container in the refrigerator or produce section of most grocery stores. There is little difference between a firm or extra-firm tofu, so try both kinds and see which you prefer. Firm or extra firm regular tofu is best used in stir-frys, making baked tofu or any dish where you will want the tofu to retain its shape. For recipes that call for crumbled or mashed tofu, such as a vegan ricotta cheese or scrambled tofu, firm tofu will work just fine, though medium or soft tofu will have a smoother consistency. How to Prepare Vegan Lemon Tofu "Chicken"
What Products Are Made With Soybeans and Are They Nutritious?